An olde English pub featuring modern culinary flair. Be transported to a fox hunt on the English countryside while dining by the fireplace in our "Hunt Room" or dine casually on our patio overlooking the Grand Canal Shops. Take in a proper football game at our bar flanked with 13+ large screens and enjoy a pint or our 16 craft beers on tap or full bar with drink selections from around the globe. 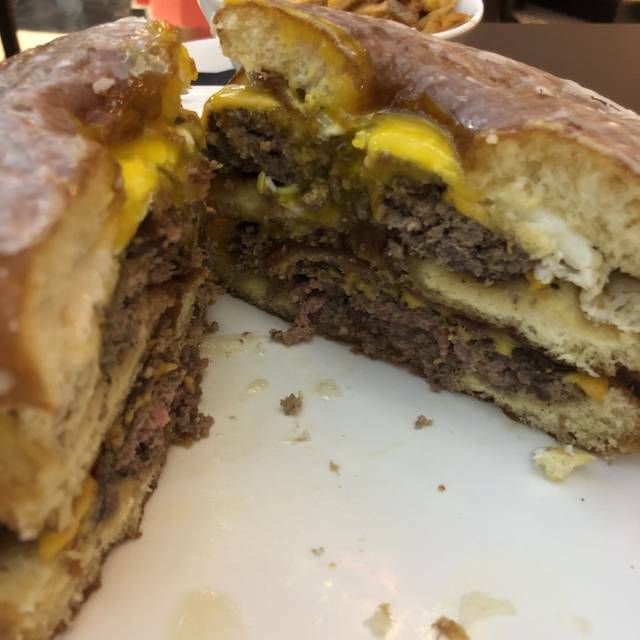 Indulge in our house favorites like the Donut Burger- a double bacon cheeseburger built between three glazed donut layers and topped with a fried egg. We do feature salads but much prefer a Chicken Bacon and Waffle melt or Prime Rib, Sea Bass and Fish and Chips! No Meal is complete without a Alcohol infused milkshake or Guinness cupcake! Roast beef was great, make sure you ask them to trim the fat. First time there. It was a little difficult to find but once there all went well, food excellent but thought drinks were overpriced as was food. However it is Vegas. Much more value at home in Florida. They did give us discount for grand opening but still pricey. Enjoyed evening and time there regardless. The food specials were good and the food was better than fair. They could use more waitstaff for dinner. We asked for our check but it took the waitress a little over 30 mins to get back to our table. My wife and I visit the Venetian three times a year and we have never tried the Royal Britannia Gastro Pub until now. What a pleasant surprise to experience a great meal that is affordable enough for families. My wife had the Princess Cut Prime Rib and I had the Fish & Chips. The prime rib was cooked to perfection and the mashed potatoes and gravy could easily feed two people - great value for the price. Our waitress was awesome and checked on us at least four times and even the restaurant manager came by to see how our meals were. We will definitely come back on our next visit. Our waiter made us awesome shakes! We were in town from San Diego and met friends from Tulsa for lunch. The server (Annie) was excellent as were the Bloody Mary's and beers. Everyone seemed to enjoy their meal, but I ordered the Caesar salad and Clam Chowder - okay, but not great - salad was nothing special/nor was the dressing and the soup was in desperate need for at least one clam:-). Thanks. The food was good, but service was lacking. It was not busy just seemed like training was missing to teach servers how to wait. 45 minutes after dinner with no offer of dessert or something else to drink I had to stop someone for the bill. RB Cuisine: Not going to lie, I came here for the donut burger. Glazed donut top, bottom and the middle like a Big Mac. Cheese, fried egg, bacon and a burger patty cooked medium as I asked. This sounds extra, it is and it works for me. I'm not sure why I ordered fries with this behemoth but they were tasty. The Fish and Chips and the Chicken Bacon and waffle melt were tasty and came out in massive portions. This is a great place to come hungry. Overall we had a great dining experience and once again mad props to our waiter for the excellent service. The location is kind of off the beaten path buried deep in the Venetian canal shoppes. It's definitely worth a visit and I'll be back to check out more social media friendly dishes in the future. Enjoy! Super slow kitchen service the night we were there, but great staff made it easy wait- worth a try and hopefully they’ll get the kitchen worked out. Perfect place to grab drinks for a "happy hour" business meeting. Used the pub for seeing clients while at SHOT Show. Excellent service and reasonable noise level for conversation. Only had drinks so I can't speak to the food quality and value. The wait was WAY to long for how not busy they were. Ordered burger well done no pink. It was pink. Flavor of burger was good and fish n chips were good. Daughter got the lobster roll. Was good but bun was huge, way to much bread for amount of lobster in it. be prepared to wait for food. Great food and fun atmosphere, plus our server Eric was really helpful and friendly. I would definitely recommend. Very good. Food was really great compared to what i thought. Um...let’s just say that the results of the poutine and calamari led to our whole family vying for the bathroom all night long...unfortunately. Fun lunch, great service. Loved the milkshakes and burgers. We will visit again! Our server, Lenne, was excellent. The food was good, hot and tasty. Nice atmosphere. Great experience overall. The lobster mac-n-cheese was fantastic. Our service from beginning to end was better than many of places we’ve been on the Strip (TY, Dres!). Lobster Mac and Cheese appetizer was awesome. Rest of food - salmon, fish n chips and burger just okay. Strawberry shake not good - it’s a ton of strawberry syrup and frozen strawberries. Great service. Great food. Amazing milkshakes. Great grand opening prices!!! The food, Lobster Roll, was absolutely great. What a wonderful gastro pub. We were a party of 10 and they accommodated us with an awesome table toward the back. Great selection of brews, great menu. Overall great exxperience, we will be back! GF and friend asked for pickles on hamburgers. Hamburger came with no pickles, instead one got a 1/8 spear on side. Requested pickles, waiter came back and said we are out. Then when we got the bill we were charged an extra $1 for the pickle. To top it off place was more then 1/2 empty and it took forever to get everything (drinks, appitizers and food). This is first time I have posted a bad review. I love pub food but our main meal just did not make it. The mushroom soup was very good as were the onion rings. However our Reuben sandwich was fatty with too much cheese and hardly any corned beef flavor. Read many good reviews and thought the food would of been much better. Plantings ( French fried topped with onions, mushroom and gravy was supper soggy. Fries needed to be cooked more. Fish n chips fries were so so salty it hurt my tongue. My mom who over salts everything even complained how salty it was. The donut burger was ok. The calamari was overly sweet and soggy. Sauce should be put on the side. Waiter was very attentive. Hair in food, poor service. Didn’t replace food just removed from check. Our waiter was exceptional. All of his recommendations were spot on. Great food, great service, great prices. Don't miss eating and drinking here! This restaurant had not been open that long, but the service was excellent, the food was great and the atmosphere was perfect. we will definitely return on our next trip to Vegas. Well, not exactly a british pub, but apparently as close as it gets. Bison Burger was very fine, but with the Chicken Pie they definitely have to learn. Very attentive service! So, all in all, they have potential, but are not yet fully there. It’s hard to come across a new restaurant in Las Vegas that offers ambiance , quality , service without costing an arm and a leg . This evening my wife had the pleasure of enjoying dinner at Britannia Gastro Pub in the Venetian hotel . The English style pub reminds me of my visit to England with its dark wood decor done tastefully , surrounded by no less than 20 TV monitors to catch your favorite sporting event . We ordered the shrimp cocktail to start which came with a generous amount of large shrimp . Both were a large portion and expertly prepared . The prime rib was succulent , tender and well seasoned . The fish was light , flaky and had a good crunch on the batter. We both agreed that we would be back with the family . I don't know if this place is going to make it. For "British Pub" the food is not British, and it's not great either. With so many options in the Grand Canal Shoppes area I would pick another place next time.